One the juiciest parts of blind-tasting wines is the shock and awe when you uncover a really, really tasty find. It’s like unearthing a lost twenty in your jacket pocket or getting something on sale that you needed anyway. A delicious surprise. I hadn’t tried Pepi wines for many years, finding them rather boring and uninspiring in days past. But this fruity little Chenin-Viognier number caught the eye of every taster at the group tasting table. From the wine pro to the casual consumer, virtually everyone gushed, anxiously awaiting the “reveal” to find out the price. So they could go buy a case. They got their wish… Pepi Chenin Blanc-Viognier is quite affordable at $10. ‘Tis unfortunate, but Chenin Blanc hasn’t quite caught on outside wine geekdom. It’s often incognito in French wines, nestled underneath the Vouvray moniker. Most domestic wineries are loathe to produce a wine that Americans haven’t heard of. So it takes some balls to produce a wine — not labeling it under a “white blend” fanciful name — and boldly pronounce it a Chenin Blanc-Viognier wine. Bravo Pepi, for the hutzpah. Only a few have traveled this route… Napa’s Pine Ridge made a reputation on the same white wine melange and Washington’s Hogue Cellars — rather known for their courage — makes a nice, single varietal version. Alone in the bottle, Chenin tends to be high in food-friendly acid, accented with peaches and lime. But made under the wrong conditions — like when it was enslaved in California “Chablis” jug wines in the 1970’s — it can be tired, unctuous and bland. But… with discerning care and a hefty 34% addition of Viognier, the game changes… transforming into an infinitely drinkable, softer and refreshing wine. Like this Pepi. 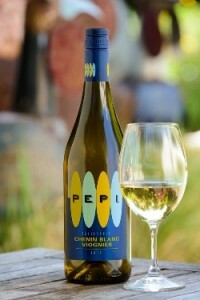 Pepi 2011 Chenin Blanc-Viognier smells clean with citrus and floral wafts. Layers of flavor from honeysuckle, peach and lime zest meld together to provide a crisp, thoroughly enjoyable white wine that would be just as comfortable at a dinner party as on a patio. Round and balanced in the mouth, it has a Viognier fruitiness to it that is down-played quite masterfully so that it doesn’t become sugary, only nicely juxtaposed with Chenin’s tartness. Great effort and fantastic value. Occasion: Sample sent from winery. Tasted blind. Food pairing: Spicy Asian dishes like Shrimp with Sliced Fennel or Asian Turkey Lettuce Wraps, salads and light chicken dishes. Never miss a single word on TaylorEason.com! Sign up for my newsletter or for my RSS feed.